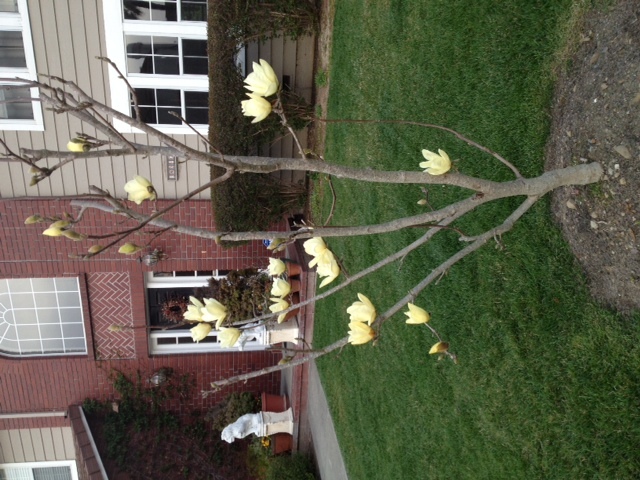 I don’t know how I managed to kill the beautiful magnolia that had graced my front yard for the past twenty years. But the optimist in me saw it as an opportunity to choose a tree of my own. My search began on the internet. I then quizzed my tree-hugging son, Patrick, about branching patterns and flower colors and the ability to live in a watered lawn environment. 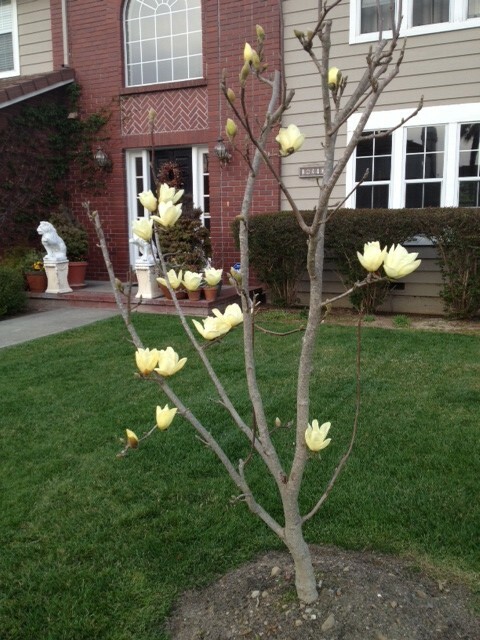 After much deliberation I settled on another magnolia- the deciduous kind that flowers early in spring and leafs out after a spectacular show of color. You have probably seen this tree in beautiful shades of pink and violet. But I was curiously drawn to the description of the magnolia with a delicate butter yellow flower. Now that it is in bloom, I am remembering why. We lived in Whittier, California many moons ago and I used to drive my son, Peter, across town to El Rancho Presbyterian Pre-school. Every Tuesday and Thursday morning we traveled down Greenleaf Ave. and took a left on Hadley, passing 100-year-old homes- some of them built at the turn of the century from Sears and Roebucks “kits”. On one corner there was a dignified old two-story home with a majestic multi-branching tree that reached beyond the rooftop. The house was painted the loveliest shade of butter yellow. I would wonder at how they decided on that particular color. It wasn’t anything like the homes around it. It was so whimsical to me in the shadow of the stately front yard tree. Then spring arrived and when we turned the corner from Greenleaf onto Hadley the secret was revealed. The beautiful tree was in full bloom showing off hundreds of buttery yellow flowers- the exact color of the house. In my imagination I decided that the first time the owners of that old stately home saw the tree in full bloom, they rushed to the nearby paint store with one of the delicate cups in order to match paint for the house. In order to dazzle themselves and passer-byers with a work of art worthy of the finest museum. If only for a yearly one- month exhibition. I will never know if my fantasy is true. I don’t even know if that tree is still standing. Perhaps some type A homeowner decided it was too “messy” and cut it down. Maybe the house is now a modern shade of slate green. Be that as it may, I have planted my own museum piece in my front yard. It serves my fond memories of Whittier and El Rancho Presbyterian and my curly topped Peter. It makes me happy to see it bloom and thrive. Who would imagine that a simple tree would bring such joy? I remember those houses and the beautiful trees in Whittier. Where have all the flowers gone? Seems like only yesterday. Such a fond memory! I can even smell the magnolias while reading your story. What will you paint in the same buttery yellow? I remember driving in Pasadena where my grandparents lived and how so many of the streets were lined with those magnolias. They were utterly intoxicating. Thanks for bringing the magnolia blossoms to life for us all to enjoy. Let’s bring back “nostalgia”. I think people forgot what an important component to life nostalgia is. The term nostalgia describes a sentimentality for the past, typically for a period or place with happy personal associations.